Cloud Mountain tripod projection screen is designed to give the user a professional screen at an affordable price. 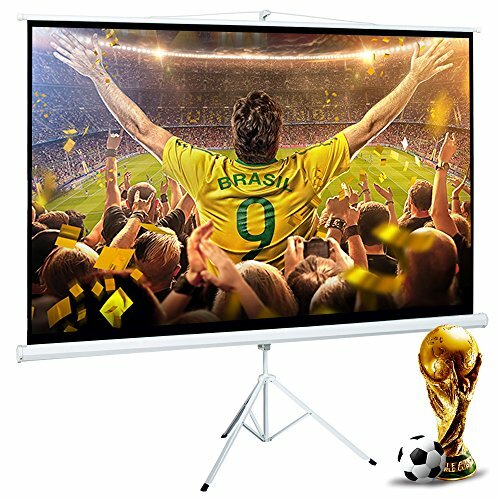 The overall effect is a superior picture quality that is equipped to handle active 3D and 4K projector resolutions. And this dependable tripod makes it ideal for professional use in large conference rooms, stages, venues and home theaters or backyard movie nights. 【High Quality Material】PVC Matte White Projector Screen, Wrinkle-free screen is mildew resistant and static resistant, and it is easy to clean with water. 【1.3 Gain HD Quality】High contrast 1.3 gain screen optimizes picture quality, 160 degrees of viewing angle with no resolution loss, give you a better viewing experience. 【Stable Tripod Stand】Tripod stand is sturdy and easy to keep balance, strong stability stand makes the screen stand better. 【Easy to Install】Auto-Locking mechanism provides adjustable height and easy operation.Only need several minutes to finish installation. 【APPLICABLE PLACE】Perfect for indoor home theater, schools, offices, outdoor movie screenings, weddings or other commercial using.